If there were ever two sides to Mieczyslaw Weinberg the composer (1919-1996) (and there were) you can hear it on the new release of two World Premier recordings, that of the Symphony No. 13 and the Serenade for Orchestra No. 4 (Naxos 8.573879). The Naxos series of Weinberg orchestral works continues, very happily, as the Siberian State Symphony under the ever-productive and even inspired Vladimir Lande chalk up a very nice performance of one of Weinberg's most dramatic scores (the 13th) and then one of his most sunshine-drenched ones (the Serenade). I won't rehearse his biography here. Look that up. He had plenty of reasons to be unhappy with his lot. But the 13th is a profound channeling of what sounds like despair, 1976-style. Lande and company give it all the torque and aesthetically deflected passion it demands. And it becomes one of Weinberg's most captivating scores in their hands. It is more evidence that the Weinberg revival is one of the most exciting ones in our time. "Revival" is maybe inaccurate. "Vival?" The liners tell us that the 13th is dedicated by Weinberg to the memory of his mother, who died in a Polish camp along with his father and sister in the early '40s. (They were Jews at a time when in Poland that was a crime.) Add to that the death of his friend and supporter Shostakovitch not long before he wrote this symphony. If the mood is downcast, there is a noble dignity in his cry to the high heavens, a sublimity of expression that transcends all of it, and here on a rainy Monday morning after the end of Daylight Savings Time in the US, it is sounding very good to me indeed. I will not attempt to describe the music here, for it must be heard repeatedly a few times before it all comes into focus and so that truly is the way to go forward in understanding. It sounds very Modern, very Weinbergian. And it is in every way a worthwhile work in the Weinberg canon. On the opposite end is the concluding Serenade, which shifts into a most lighthearted mood. The Naxos back cover blurb calls it "rumbustious!" Well maybe so. It is markedly chipper yet reflective, something no doubt that might get performances in the world Weinberg occupied in 1952, a Stalin ruled, social realist kind of place. So it is a perhaps ironic yet a fitting way to end because ends on a hopeful note and we still hear Weinberg's inventive brilliance at play. 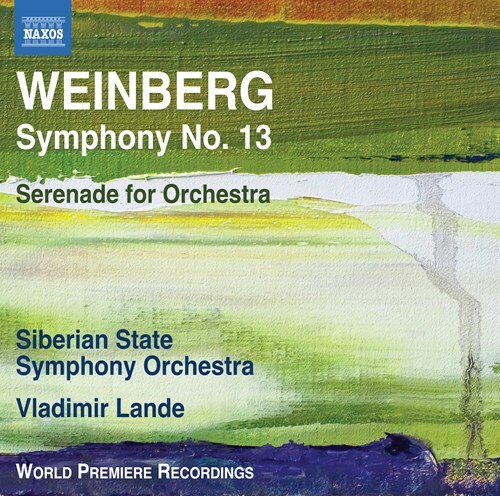 This one is a most welcome gem in the Naxos Weinberg series. You cannot go wrong at this price. And everybody should give Weinberg a hearing. This is a good place to start. Or too a great place to continue. Bravo!